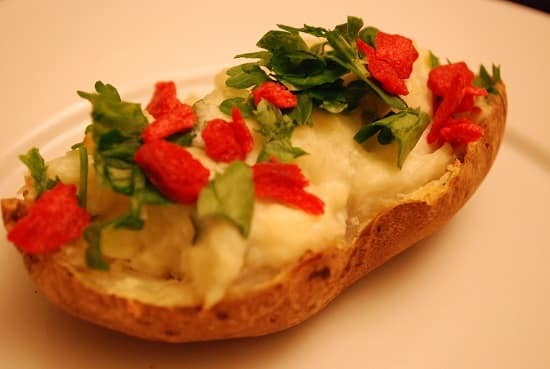 This Cheesy Twice Baked Potatoes Recipe is a great idea to serve as a low calorie appetizer recipe or even as a low points side recipe. It’s really easy and tastes delicious, hello blue cheese!!! These cheesy potatoes taste just as good as the restaurants’ version, but with much less fact and calories. Each one has just 3 Points, and is a great low calorie snack idea too! Enjoy! A perfect low calorie side dish recipe, these Cheesy Twice Baked Potatoes are just 3 Points each, and are loaded with flavor. 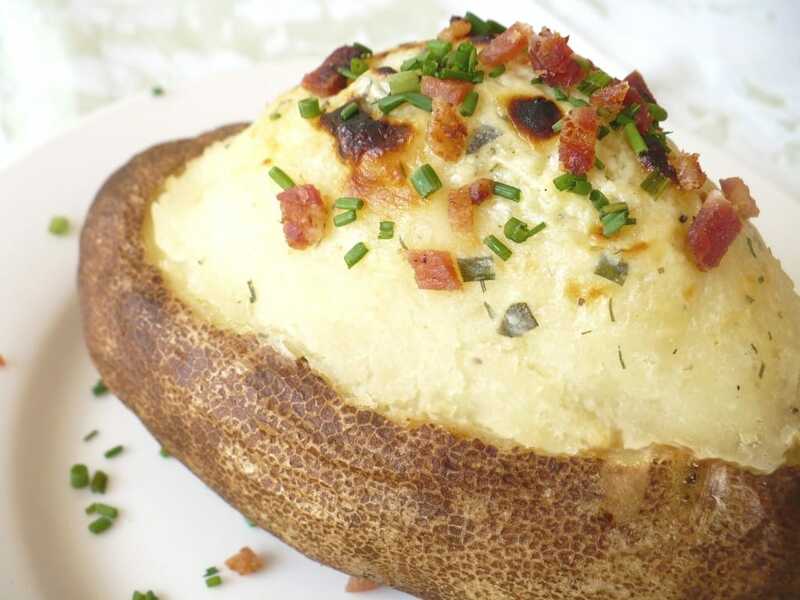 Reduced fat crumbled blue cheese, fresh green onions, and sour cream give this healthy baked potato recipe some real zing! Pierce potatoes with fork. Bake until tender, 45-50 minutes. Remove from oven; let stand until cool enough to handle. Cut potatoes lengthwise, once. With spoon, scoop out potato pulp, forming 4 shells. Place pulp in bowl; add sour cream, blue cheese, green onions, salt & pepper and parsley. With fork,, mash until combined. Top with a bit more green onions, parsley and bacon bits. I'm an avid calorie counter, can you tell me how many calories are in these? This is an old recipe that I don't have the nutrition stats for. I'm slowly in the process of rebuilding all of my old recipes to update them with the new Points Plus values and to include the nutritional stats. I was wondering how to convert from the old points to the new points… anyone know how to do that? Is this 2 points on the old WW system or 2 points on the new Plus points system, and does that go for the rest of the recipes as well. I am so excited to try this recipe as well as some of the others on here, just want to make sure I am using the correct points system! Any recipe that is listed with "Point Total" is the old Points values, and any recipes that are listed with "Points +", are the new Points Plus values. All the recipes that I posted last year are with the old Points, and all the new recipes that I started posting in 2011 are with the new Points Plus. In the title of each post, you will see the Points value indicated as either "Point Total", which is the old Points, or "Points +", which is the new Points Plus. Hope that helps and thanks for reading! This was really good, made them last night! Easy and tasty. Assume that other cheeses could work as well, like Goat cheese? I am tempted to put a tiny bit of skim milk in the next time just to give it a little more liquidity….maybe I just need to mash more! Great question! And I have some good news, for you….grab your fork, girl, because each serving REALLY IS only 2 Points! Keep in mind that each serving is only a half of 1 potato, with 1/4 of the topping mixture. The blue cheese and fat free sour cream are divided up amongst 4 potato slices — so you aren't getting the whole 1/4 cup of sour cream and 1/4 cup blue cheese crumbles in one serving. Yay!! This looks and sounds yummy~! Thanks!